Results - John Snow, Inc.
Mira Sunar poses with her new bicycle. 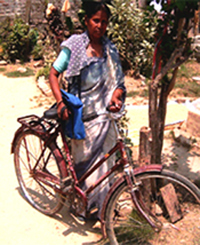 Mira's community gave her the bicycle to show their appreciation for all the ways in which she's helped their families stay healthy. "When I come to visit the village, women say 'Mira is coming, she must have something new for us,'" says Mira Sunar, a female community health worker, describing her relationship with the villagers of Ramnagar, Nepal. "I feel proud and empowered by my popularity and recognition in the village." She smiles. A citizen of Nepal would never expect such a statement from a woman like Mira. Mira was born into the Dalit class, the lowest tier of the Nepalese caste system. Historically members of this class have been labeled "untouchables" and are expected to behave submissively to members of superior classes. For centuries, higher classes have imposed restrictions on Dalits, such as segregated religious and political facilities, and people have generally shown little respect for Dalit individuals. However, since she started working as a female community health volunteer, Mira Sunar has gained the respect of families across the caste system. Recently, a woman reached out to Mira. The woman's son had been suffering from a chronic illness: he frequently came down with fevers and chills and would feel weak and nauseated. The boy's mother, while trying to stifle her nervous tears, described how his symptoms worsened each time. Mira measured the boy's respiratory rate and reviewed his symptoms. She diagnosed the child with chronic pneumonia and prescribed him Cotrim P., an effective antibiotic for such illness. After three days the child's symptoms subsided, and another change occurred: the child's mother began acting respectfully towards Mira. A week after her child's recovery the woman invited Mira to dinner at her home. Many people would be surprised at such an unconventional gesture from a member of a higher caste, but not Mira. Mira, who has seen ingrained habits dropped and friendships formed after many years of health service, graciously accepted the invitation and returned to her work. Each month, Mira treats five to eight pneumonia cases. She also counsels 15 to 20 mothers on antenatal care, delivery and family planning. She provides iron to pregnant women and vitamin A to postpartum mothers. And she administers polio vaccinations during campaigns and vitamin A supplements during twice-annual distributions to young children. The Nepal Family Health Program II, funded by the U.S. Agency for International Development (USAID) since Dec 2007, builds on work over the previous six years of Nepal Family Health Program phase I, also implemented by JSI Research & Training Institute, Inc., to reduce child and infant mortality, support use of family planning, and strengthen community-based health services throughout Nepal. In her 16 years as a female health worker, Mira has seen dozens of people change their attitudes toward her. The villagers greatly appreciate Mira's work and describe her as sharp, dedicated and industrious. The whole community recently honored her with a gift: a brand-new bicycle. This is not the first gift bestowed by her neighbors; she has received dresses and other simple, but meaningful, presents. Responding to the endowment of this gift Mira says "God has given us a big family, and we have to secure our place in that family." Despite the divisions of the caste system, Mira has found her place by saving young lives, treating her neighbors, and gaining the respect of her entire community.